Children today are immersed in entertainment and news media, like fish are immersed in water. Using hand-held devices, children can consume media just about anywhere or anytime they want. Violence is a common theme in the media (e.g., TV programs, movies, videos, video games, music, books, and comic books). Pediatricians, policy makers, and parents often wonder whether violent media are harmful to children. Fortunately, we don’t need to rely on unreliable sources to answer this question, such as common sense, gut feelings, intuition, instincts, premonitions, or the biased claims of the media violence industry and its apologists. Science has provided us the answer to this question. Over the past six decades or so, hundreds of research studies have been conducted on this topic. Experimental studies have shown that exposure to media violence causes people to behave more aggressively immediately afterward. Field experiments have produced similar effects in natural settings with realistic measures of aggression. The effects can be long lasting too. Numerous longitudinal studies show that exposure to violent media as a child predicts aggressive and violent behavior many years later as an adult. Although there is never complete consensus in any scientific field, the evidence is so convincing that dozens of major scientific and medical organizations have issued statements about the harmful effects of exposure to violent media, such as the American Academy of Pediatrics, American Medical Association, American Psychiatric Association, American Psychological Association, the U.S. Surgeon General, the Society for the Psychological Study of Social Issues, and the International Society for Research on Aggression. Violent video games may be especially harmful because of their interactive nature, but more research is needed on this issue. Consequently, pediatricians, parents, and policy makers should take steps to protect children from the potentially harmful effects that can occur from violent media exposure. If two or more answers are "yes," think very carefully about the lessons being taught before allowing your child access to the game. Don't buy video games that are potentially harmful to your children. 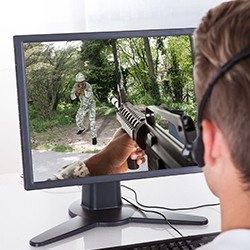 Don't allow access to violent video games. When your child visits a friend’s home, tell that parent that your child is not allowed to play or watch age inappropriate video games. If you learn that a retailer is selling violent games to children, complain to the owner/manager. If you learn that a retailer is doing a good job of screening sales or rentals of violent material to children, thank the owner/manager and support the business, perhaps by purchasing nonviolent educational video games. Consider not purchasing products from companies that sponsor violent video games, and tell them why.